As the kitchen is the heart of every home and the busiest area inside your house. When you think about kitchen décor or even kitchen remodeling you need to pick every little item with high care degree. 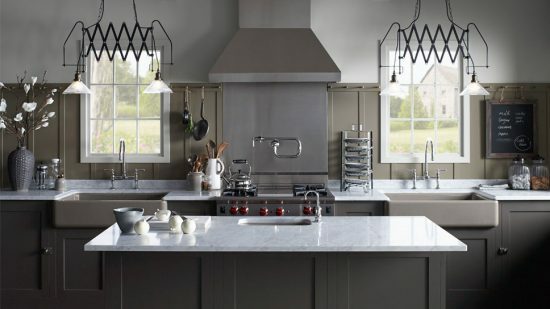 As you wish to create a dream kitchen look with the necessary functionality required. The kitchen wouldn’t complete without the basic items inside like cabinets, countertop, appliances and some of the essential accessories as a kitchen sink and its complement faucet. In this article, we are going to focus on the kitchen sinks which are essential for the kitchen functionality and they can add a beautiful look either to the kitchen. The kitchen sinks are nowadays available with different shapes, sizes, colors and also materials. How to choose the right one is depending on your kitchen capacity and style. You should match the sink with its all aspects with your kitchen look. With keeping in mind to choose the one that will last for a long time. In other words, if you have a large kitchen area you may go for a big kitchen sink while if your kitchen is smaller you may go for small one or fitted one with your area. After talking about the size, what should you consider in your kitchen sink to be perfect? You should consider a practical kitchen sink material that will withstand heavy use and resistant to the high-heat and the corrosion. Remember to choose one is also easy to clean. There are varieties of materials that can fit every kitchen style from the stainless steel and ceramic sink to granite and fired clay ones. These sink types are available with different colors as you desire. A granite sink is elegant and popular for the people who need to add a different look inside a kitchen beside its practical benefits. If you have a minimal modern kitchen you may go for a white colored kitchen sink. You may also be creative by purchasing a sink that come with specially designed chopping boards alongside by stainless steel baskets and its special tap. Remember always that you deserve the best for your home and go for shopping. What is 8 * 4?